Why, Hello Buffalo: New buffalo milk cheeses are here just in time for summer! Early summer heat is just starting to hint at the onslaught of heirloom tomatoes to come, and our buddy Giorgio in Campania has been sending us some new iterations on the old classics of pasta filata (stretched curd) cheeses. Last week we got our first taste of truffled Mozzarella di Bufala with itty specks of black Italian truffle, along with Burrata di Bufala. We’ve done our due diligence by tasting them again… and again… and again, and after all of that rigorous quality control testing, we think we’ve found something pretty special. Our Mozzarella di Bufala hails from Campania, Italy; home to both mozzarella and pizza galore. 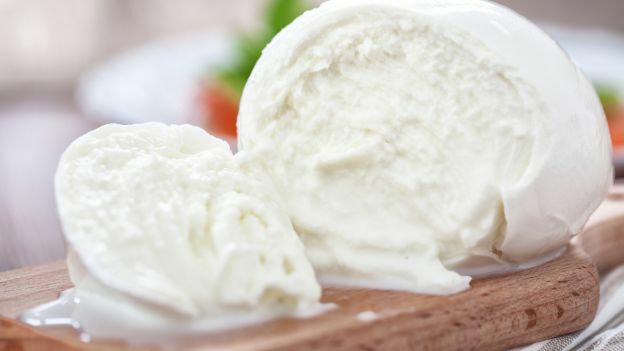 We bring in weekly air-freight shipments of Mozzarella di Bufala, and now Truffled Mozzarella di Bufala, and Burrata di Bufala direct from Italy to Minnesota. We keep foodservice Mozzarella di Bufala as well as a fantastic domestic cow’s milk burrata from the Liuzzi Angeloni in stock. Mozzarella di Bufula is a bit of an anomaly – somehow the richest milk (water buffalo milk has twice the fat of cow milk!) is transformed into a feather light pillow of cheese. Water buffaloes produce less milk than dairy cows, and with their intimidating horns and larger overall physique it takes a bit more bravado/fearlessness to milk them. The challenge then falls to the cheese-maker to turn a particularly unforgiving milk into a delicate fresh cheese. The resulting cheese is porcelain white (buffalo milk doesn’t contain the butter yellow carotene found in sheep and cow milk) bright and fruity, and has just a bit of underlying wild gameyness. The texture is rich, supple and nearly custardy. Because the cheese is packed in water, it should be drained well before using.